Install current dev build and post some feedback about the Windows 10 glitch. I must have uploaded the wrong file. In my tests the line was present, but the code inside the uploaded file indeed misses it again. I am pleased to report that there is some progress. Technically the line is a 1px high background image on tab toolbar, that gets hidden by tabs. Unfortunately it is meant to be like that. Otherwise it would affect all tabs including active tab, but there are other ways to achieve the border on inactive tabs. I will add something on next update. Last edited by Acid Crash on November 15th, 2016, 1:17 pm, edited 1 time in total. 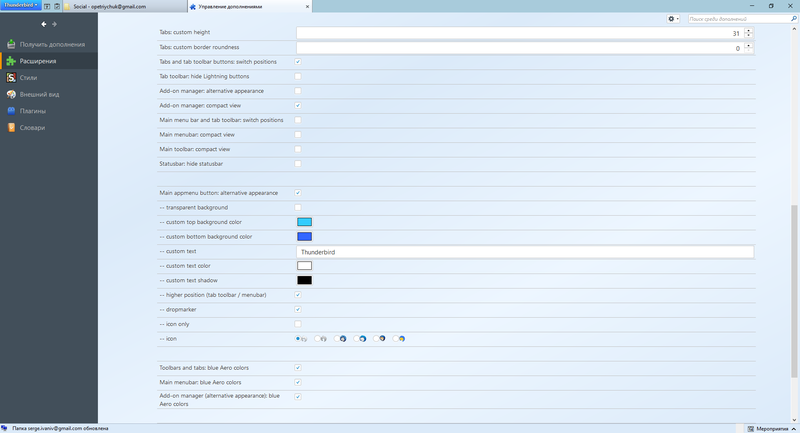 The option "Add-on manager (alternative appearance): blue Aero colors" should not be checked when "Add-on manager: alternative appearance" is unchecked. I will correct this one next update. All bugs on Win 10 are fixed now. Hi, Aris. I recently noticed a couple of little things with CMB. First, if I open enough tabs to make the scroll arrows and dropdown marker appear, then I have to close an "extra" tab to make them go away. For instance, on this machine, I can open 4 tabs with no arrows; a fifth tab causes the arrows to appear. Closing one tab doesn't make them go away, but closing two tabs does. The second thing is on the CMB addon page. If I click one of the links (such as the link to this forum), then it opens the link in the same tab, and I can never get back to the addon page without selecting "Add-ons" from the menu again. Could these links open in a new tab? I notice that some other addons do that and it works better for me. CMB 1.0.4, TB 45.4.0, Windows 7 SP1. Can you test this build and tell me, if the tab problem is still present? In this build clicked links on CMBs options page open new tabs too. Aris wrote: Can you test this build and tell me, if the tab problem is still present? The tab problem is fixed. I can now open 9 tabs before I get the arrows, and closing one tab makes them go away. Thanks for that and for the links opening in a new tab. 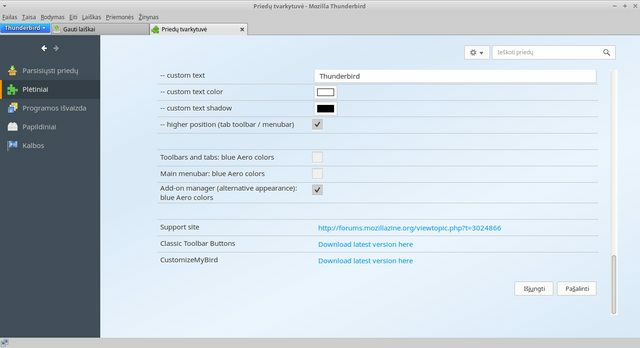 Thanks, Aris, for the update to 1.0.5.